You know that clutter negatively affects your performance. You also know that keeping piles of paperwork all over your desk is a bad idea. But yet, it happens every day. The problem is that it’s hard to get organized when you don’t know where to start. However, with the right filing supplies, it’s easy to de-clutter all that paperwork. And in the end, work will be much easier to get done. Shelving Dividers: keep your files grouped and standing upright within their appropriate categories. In addition, the dividers keep your files packed just snuggly enough for easy access. Custom File Folders: allow you to create the perfect folder for your filing needs with numerous design, material, and color options. 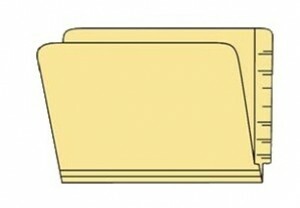 File Folder Labels: let you make your own system that can include numeric, color-coding, and much more. Oblique File Compartments: allow you to store even more paperwork in less space. And they can be used on shelving, in file cabinets, in drawers, and even in overhead cubicle space. Redrope File Pockets: work great for lawyers that need to store multiple documents and case files in one place. Of course not all industries and business are the same. Filing supplies that work for one company, might not work for another. That’s okay; we’ve got you covered. 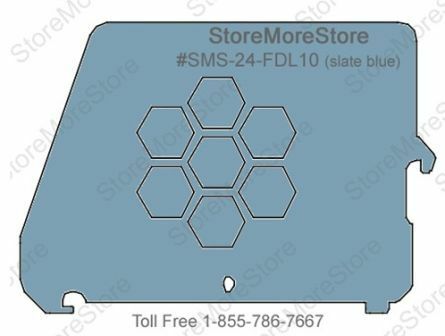 At StoreMoreStore we have all types of filing supplies to make sure you get the right one for your needs. 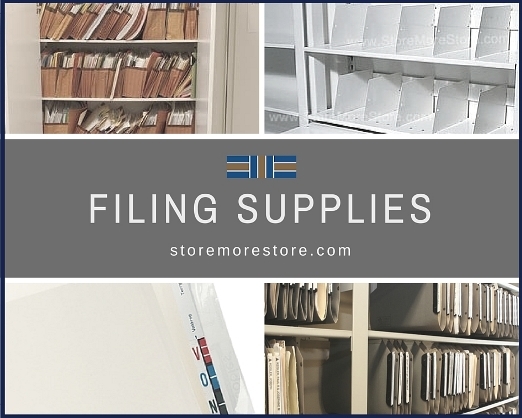 To see all of our available filing supplies, visit us online. And if you have any questions or want to talk more about your filing supply needs, please don’t hesitate to give us a call at 1-855-786-7667. 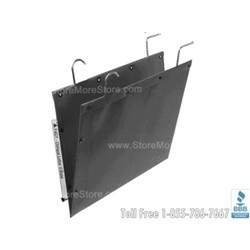 End tab folders and classification folders are your standard solution for storing papers and documents. They are an inexpensive way to keep everything you need all in one place. 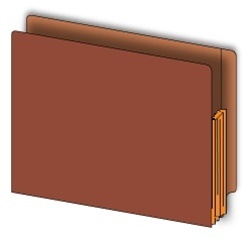 Redrope file pockets work great for lawyers that need to store multiple documents and case files in one place. They even have a handle that enables you to easily grab the pocket. 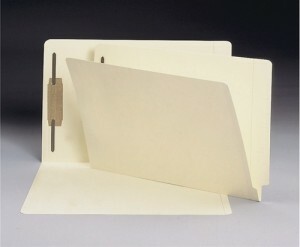 Hanging file pockets allow you to store even more paperwork in less space. And they can be used on shelving, in file cabinets, in drawers, and even in overhead cubicle space. 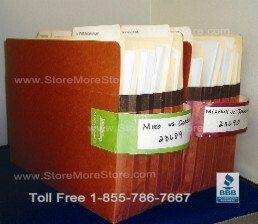 Tabbies file pocket labels have a large writing area for you to name your folder. They also double as a handle for redrope file pockets and come in a variety of colors. Smead ColorBar labels print one-piece labels from color bar label printing software from an ordinary office printer. The colorbar printing software and file folder name labels make organization, categorization and identification of files quick and easy. Shelving dividers are one of the best ways to keep your files grouped and standing upright within their appropriate categories. In addition, the dividers keep your files packed just snuggly enough for easy access. 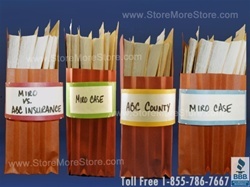 These are just some of the great options for filing supplies you can find from us at StoreMoreStore. If you have any questions or need any help, give us a call at 1-855-786-7667. Legal offices generate tons of papers every year. Pleadings, correspondence, briefs, exhibits, memos, and more are all essential to the practice of law. Unfortunately, the tasks of managing and storing paper aren’t going anywhere anytime soon, so you will need legal filing supplies for efficient document storage and retrieval. At StoreMoreStore we provide a variety of legal filing supplies including Tabbies® labels and file pocket handles, part number 68801. 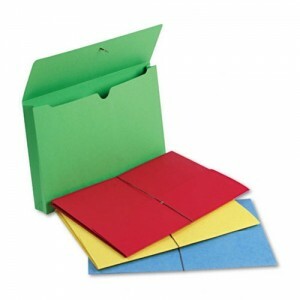 There are many benefits for organizing your legal documents in redrope expandable folders. The expandable folders will hold more paperwork, allow for grouping of folders, and provide extra strength and durability. However, every time someone pulls on that gusset, it wears the gusset down, which means it will eventually rip or tear. A great way to prevent gusset tearing is with Tabbies labels and file pocket handles. 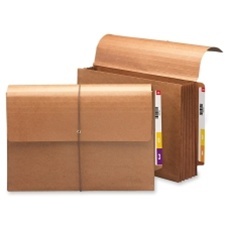 Tabbies labels and file pocket handles allow you to retrieve redrope folders with ease because they are made with Tyvek® material (the same material that is used in high quality shipping envelopes), which prevents damage to the redrope gussets. • Available in 6 colors, which means you can color code them by client, attorney, date, area of law, etc. In addition to Tabbies labels and file pocket handles, we have all kinds of legal filing supplies online at StoreMoreStore. Check out our letter and legal size redrope folders, file shelving, and rotary file cabinets. Can’t find the legal filing supplies you’re looking for? Don’t worry, just give us a toll free call at 1-855-786-7667 or send us a message to get in touch with one of our legal filing supplies experts. Don’t Miss These Super Legal-Size Deals! Here at the StoreMoreStore, we’ve always been known for our fantastic end tab file folder pricing. But we also like to surprise our customers with special deals on popular items. This month we are running a special on selected end tab legal-size file folders and end tab red rope file pockets. Some of these products are on sale at prices over 50% off. This is an opportunity for attorneys and others to stock up on those every day filing supplies at a tremendous price savings. Check out these deals! These red rope file pockets have heavy-duty Tyvek® gussets and are practically indestructible, so you’ll be able to use them for years. Check out these specials. Or how about these legal-size expanding wallets available in an assortment of colors. Order now, we have limited quantities of these items and they are sold on a first come, first serve basis. Be sure to bookmark our “specials” page so you can check out future savings! Check out our selection of pre-owned high density file shelving and see what we’ve got available here at StoreMoreStore. This is a fantastic opportunity for small to mid-sized businesses to access the same kind of compact shelving solutions that allow bigger companies to operate efficiently.